Russia's ongoing dispute with Britain escalated dramatically today as officials in Moscow announced the cancellation of a major exhibition of Russian and French masterpieces at the Royal Academy in London. The director of Moscow's Pushkin museum said the exhibition - From Russia: French and Russian Art Masterpieces of 1870-1925 - would not take place. It had been due to open at the RA on January 26, and was supposed to be one of the highlights of the academy's year. Irina Antonova, the Pushkin's general director, said paintings from four Russian state museums would not be loaned to the UK because of worries that they could be subject to legal claims and would not ultimately be returned to Russia. "I learned about this only last night," Antonova said. "The British side did not guarantee the return of the exhibition, which includes masterpieces of Russian and French art from four Russian museums - the Puskhin Museum, the State Hermitage Museum, the Tretyakov Gallery and the Russian Museum. "As negotiations on such guarantees have ended unsuccessfully, the decision on returning all the exhibits to Russia has been made." The announcement comes against a backdrop of deteriorating relations between Russia and Britain, and follows the Kremlin's decision last week to close the British Council's two regional offices in St Petersburg, Russia's second city, and Yekaterinburg. The Russian foreign minister, Sergei Lavrov, admitted the closure was in response to Britain's expulsion of four Russian diplomats in July over the Alexander Litvinenko affair. Russia had indicated that the offices could stay open if Britain dropped its investigation into Litvenenko's murder - a demand the UK government refused. Today's announcement is a severe blow to the RA, which had hoped the dispute could be resolved in time. Many of the 100-plus paintings have never been shown in Britain before. 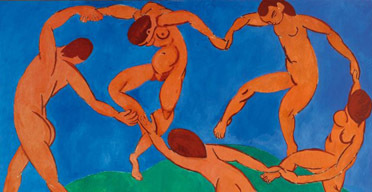 They include Matisse's Dance (11), which measures four metres by three metres, six Gaugins, a handful of important Cezannes, and works by Renoir and Picasso, including his extraordinary the Dryad, produced the year after he painted the groundbreaking Demoiselles D'Avignon. The works - currently on show in Düsseldorf - will now be packed up and returned to Russia. "There was a situation not very long ago in which the return of our paintings following an exhibition in Europe was endangered. We are not going to step on the same rake again," Antonova told the Interfax news agency today. The RA said it had not been informed that the exhibition had been cancelled, and was seeking clarification from the Russian government. "The Royal Academy of Arts has not received any official notification regarding the status of the exhibition ... and is seeking clarification with the Russian ministry of culture, a spokesman said. Many of the paintings originally belonged to Sergei Shchukin, one of tsarist Russia's most prominent collectors. His descendants, including his grandson, Andre-Marc Delocque-Fourcaud, have lodged several failed legal claims to get back the works, which were seized by Russia's communists in 1917 and declared state property. Britain had promised to deliver a 'letter of comfort' assuring Russia that its works would be returned. However, with anti-British sentiment now official Kremlin policy, this appears not to have satisfied Russia's bureaucrats and the Russian government's two main cultural agencies, Roskultura and Rosokhranultura. In an interview with the Guardian in October, the director of St Petersburg's Hermitage Museum, Mikhail Piotrovsky, expressed optimism that the RA show would go ahead as planned. "Culture is not politics. There is much more goodwill. We will find a solution," he said. "The Royal Academy is our friend. "This exhibition is very important for Britain. It is a beautiful exhibition. It's made up of Russian avant-garde, and Russian collections of the European avant-garde. The Department for Culture, Media and Sport is currently drafting legislation, which will guarantee art works immunity from seizure, but it has not come in time to save next month's exhibition. The Russian president, Vladimir Putin, and Gordon Brown had been intended to contribute forewords to the exhibition catalogue. Brown has not met Putin since becoming prime minister, and officials have indicated there is no likelihood of a meeting ahead of next summer's G8 summit.